Wedding marquees can set that unique theme you’re looking for that no other venue will. Our experienced team will help bring your ideas to life and get the look you desire. Pelmets that are contoured to your wedding marquees theme. Falling drapes that dramatically enhance your setting. Coloured carpets that harmonise with your event style. Table linen to complement your theme colours. Bring an essence of your personality and make your marquee sparkle on your wedding day. For more ideas on your theme contact our team. Decide where you would like your entrance and reception to be placed. Choose the exact location and direction your marquee will face. Add window walls where required and take advantage of scenic landscapes and natural light. Take advantage of great weather and open up designated windows and walls. Select a dedicated area for your catering. Design your interior layout with our free marquee planner. 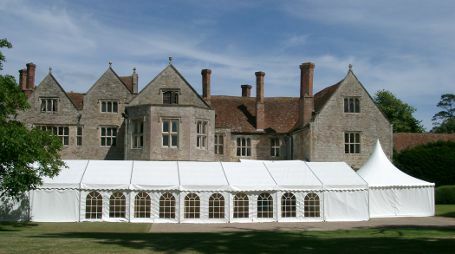 Wedding Marquees for private hire have little or no restrictions compared to hiring a venue. Be flexible on controlling what time the party starts and finishes. Use your own chosen caterers instead of expensive venue approved caterers. Supply your favourite wine and champagne rather than the standard choice from the venues drink list. Avoid unnecessary corkage fees applied by many venues. Get Your Quote to arrange a site survey of your venue. There are no internal pole restrictions for your Clear Span Marquee structures. They have the ability to withstand British high winds and rainfall. Extra’s to suit your style and theme. Chair sashes and chair bows. canapé areas or hog roasts. Read more about the above products on our marquee equipment page. Get help with planning your costs with our FREE downloadable Wedding Budget Planner available with your Marquee Quote here. Still looking for a wedding venue? See our list of Marquee Venues which cover areas in Leicestershire, Warwickshire, Northamptonshire and Nottinghamshire.